As it turns out, Dr. Davis had managed to get a strand of hair from the mammoth man from his earlier adventure – and has used it to create her own clone of the creature! As she and her two henchmen prepare to bring the clone to life, they see a news report regarding the “riverfront monster”, none other than the original mastadon mutant himself. Davis sends her cronies out to retrieve the mammoth man. The two men have no trouble in luring the beastie to Davis’ secret headquarters at the museum. At the same time, April and the Turtles were discussing the possibilities of their strange friend surviving the icy waters when the news report came in, and the ninjas head out to investigate. After a long search, all they manage to find is a clump of hair, which they take back to their lair so Don can analyze it. Mikey sees a TV ad for the dinosaur exhibit at the Metropolitan Museum and jokes that perhaps the mammoth dude has gone there to see the exhibit. Raph scoffs at him, but Donatello thinks Mikey is on to something, so the gang pile into their van and head off to the museum. 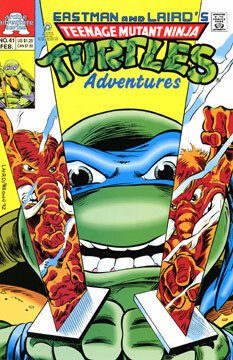 The Turtles break into the building and soon find their friend caged by Davis and her henchmen. The Turtles order the scientist to free their ally, but she orders her clone to attack and a battle ensues. Enraged, the original mastadon dude breaks the bars of his cage and clobbers his clone. Unfortunately the force of his attack causes the museum to buckle on its foundation and it begins to collapse. The TMNT and April make their escape in the nick of time. Shortly, the original mammoth man digs out of the rubble, carrying Davis and her assistants. April finds a police officer, who doesn’t know what to do – so O’Neil arranges for the mastadon dude to be shipped via boat to Arctic Island, where he will finally be truly at home.